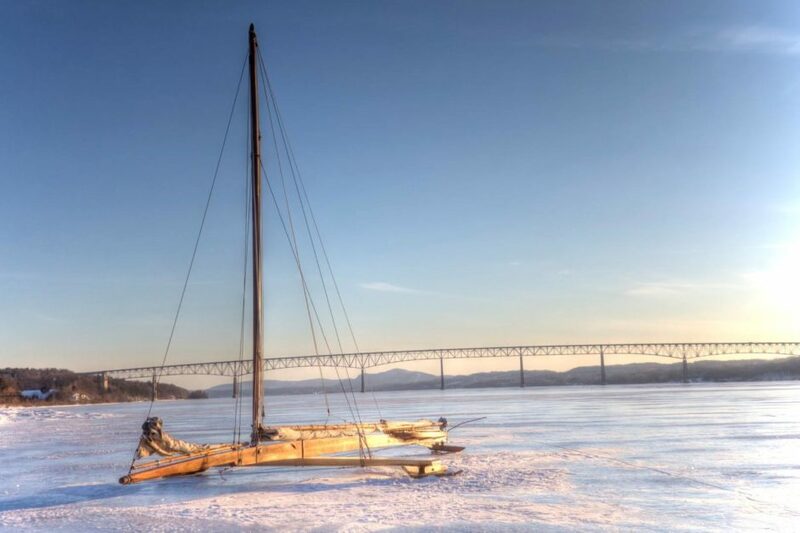 Ice boating on the frozen Hudson River! This week has felt a bit long, what with our car dying and coming back to life and of course, endlessly wishing away the winter. But! As usual, the week is ending on a higher note than it began. Without any further rambling, here is this week’s addition of Friday Gratitude, which I’m sort of stretching into what’s good, what’s positive, what’s noteworthy. You get the gist. 1. 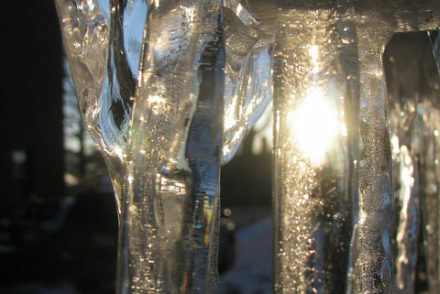 Andy’s Ice Boat Photography! 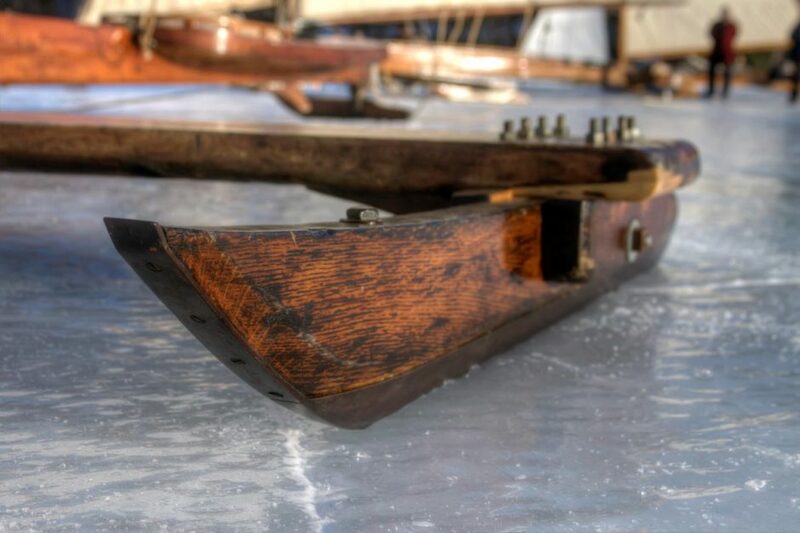 Yesterday, Andy headed to the other side of the Hudson River to Red Hook to see these historic ice boats up close. Ice yachting is an old sport that’s been getting a bit of local attention recently, since the conditions have been perfect on the river. Such a crazy thing to walk across the Hudson! And these yachts are so unique, and the light was gorgeous yesterday, and honestly, these photos speak for themselves. Oh, that perfect blue sky…! 2. Books on CD. Am I stuck in the 90’s? I don’t have an e-reader, although I’m certainly not against them. I don’t know why I didn’t think of this sooner, but lately I have been borrowing books on CD from the library and it’s such an easy way to ‘read’ while I’m driving all over Ulster County several times a week. Two I finished recently are Bill Bryson’s Notes from a Small Island (funny, and especially enjoyable to listen to with Andy) and Alice Munro’s Dear Life: Stories (my first by her, must read more! ), and right now I’m wrapped up in the lives of JFK Jr and Carolyn Bissette Kennedy as told by his assistant in Fairy Tale Interrupted: A Memoir of Life, Love, and Loss by RoseMarie Terenzio. 3. Movies. You know when you watch a film and you get that fantastic combination of impeccable acting, nostalgia, sweetness, and humor? That’s what Saving Mr. Banks was for me. Emma Thompson may not be as widely revered or as much of a ‘celebrity’ as Meryl Streep, but she has the ability to turn herself into a character just as well. I didn’t expect to laugh as much as I did watching this. Plus, it’s the story behind Mary Poppins. Automatic win for me! Have you seen any great films lately? I love the detail of the woodwork and ice in this one. 4. Gabrielle Blair, AKA Design Mom, wrote a great post opening up about her experience with mental illness. I’d been looking forward to this one for a while, since she mentioned that she was having trouble adjusting to a big move over the summer. I love how she handles so many topics with open-mindedness, sincerity, and genuine interest. She has a way of responding to her readers with grace and diplomacy, and I knew her post about mental health would be no different. She joins the list of bloggers that have opened up about depression after I started following them, which just goes to show I must have found these people for a reason. Thank you, Gabrielle! One of my favorite shots. This needs to be framed! 5. Women’s Travel Fest!! I will have a full report next week, but suffice it to say I am hugely excited to attend this event tomorrow in NYC. I will be surrounded by women in the travel industry, travel bloggers, and hundreds of other women who love travel as much as I do. Plus, the event space is stunning. Hurray for doing something that feeds my soul! What a beautiful backdrop for those boats! Your turn, friends! What’s going on for you right now? What are you grateful for, what are you excited about, what plans could you make in order to turn things around if you’re not feeling so great? I think right now I am grateful for my family and that we are taking an awesome vacation together next month to San Diego! I am beyond grateful that it is Friday, the end of the week and the door to relaxation has opened! I am also thankful that I made it out of a terrible car accident last Thursday. I can’t believe it has been a week today and I have to say that I have made a total change in how I live on a daily basis. I am keeping my attitude positive and focusing on appreciating the little things in life in addition to the big. Great way to put it, Jessica- the door to relaxation has opened! So glad you’re keeping a positive attitude, which I know isn’t at all easy to do after a car accident. I hope it wasn’t too traumatic! The ice yachting looks cold, but absolutely beautiful! I’m looking forward to girls night with my best friends tonight; a break for girl time has been a long time coming! Have fun at the Women’s Travel Fest!!! It *does* look cold, you’re right! Luckily the temperature hasn’t been bad at all lately, but with the single digit and sub zero temps we had in Jan & Feb, it’s going to take awhile for the river to thaw. 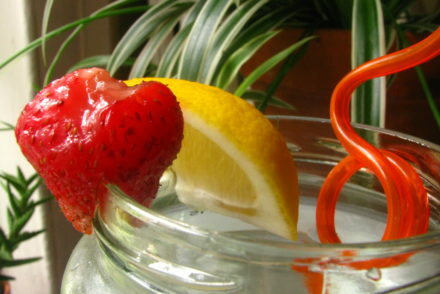 Have a great girls night tonight! I love reading grateful posts. I’m thankful for my family and my hubby who cleaned my sunglasses and washed my car yesterday. Who cleans someone’s sunglasses?? 🙂 It’s the little things. You’re right, I love that example of the little things. Something my husband does is make sure my phone is charged- so ordinary, but so nice! funny your photos are of sailboats. I’ve been thinking about and missing my dad (or dad pre-alzheimers, he’s still alive) and he loved sailing. so I guess today i’m grateful for memories and that my dad exists. Thank you for sharing this, Brett. I know what it’s like to miss someone even though they are still alive. 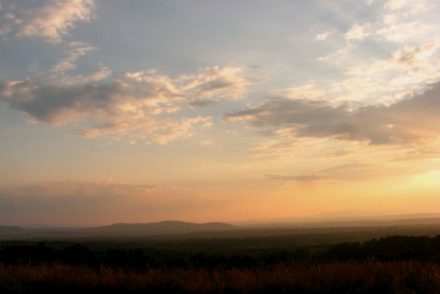 Your husband’s photos are beautiful! 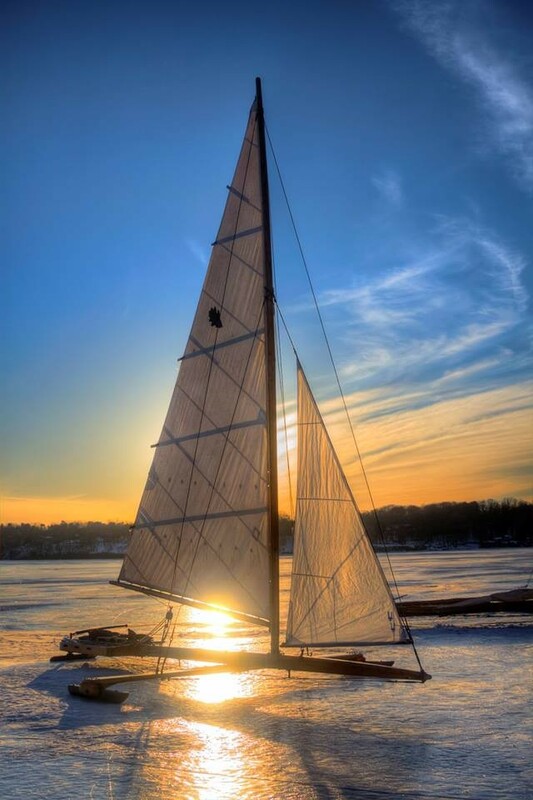 That ice sailing looks cold yet really beautiful. Right now I’m grateful that the weather will hopefully be getting warmer. Cabin fever is getting to us and we can’t wait to hit the playground! I hear you on the cabin fever. I try to go outside a lot with the boy I baby-sit for, but that ice is stubbornly sticking around and there’s only so much slipping and falling we can handle! Well, I love all those things on your list, Iva 🙂 Ice cream and pizza? Yes please! Hanging out with a girlfriend and sleeping in, both priceless. I hope you have a great weekend as well! Tell Andy those photos are breathtaking. I’ve never heard of ice yachting. Fascinating. Oh, I loved Notes from a Small Island. It was my first and only (so far) Bill Bryson. That Women’s Travel Fest sounds like the perfect event for you, Christy. Enjoy and do tell us all about it! Shana Norris recently posted…March 2014 Goals. I’ll pass it on, Shana, thanks! I had never heard of ice yachting before recently either, and now I learn my mother’s father and an uncle were both into it years ago. I started reading Bryson with ‘A Walk in the Woods’, about his time on the Appalachian Trail, and have also read ‘In a Sunburned Country’, about his travels through Australia. Can’t wait to report back about tomorrow! I didn’t realize you were coming to Travel Fest. Yay! So excited to be able to meet you! Hey Sally! You kept mentioning it and I decided to bite the bullet and buy a ticket, though of course now I’m feeling nervous as well as excited. Looking forward to it for sure, nerves be damned! I am over winter, but I do think it’s pretty awesome that all these lakes/rivers are freezing over and kids are able to enjoy walking out on the ice and doing fun things like that. Haha, I’ve never heard that quote, but it’s so true! I am *definitely* over winter. But the frozen rivers and lakes thing- unreal! It just feels so bizarre walking on the Hudson, but in our case yesterday, it was less treacherous than the muddy path we’d left behind. I have never in my life heard of this. But it’s no on my every changing life list. Looks like a blast. I had never heard of it before this year, either! That ice fishing vessel is insane! I’m grateful for my intuition with technology. I just created my first iMovie with no help for Instagram and a campaign! Congratulations on your first iMovie! You must feel so proud of yourself for doing it based on your own intuition! 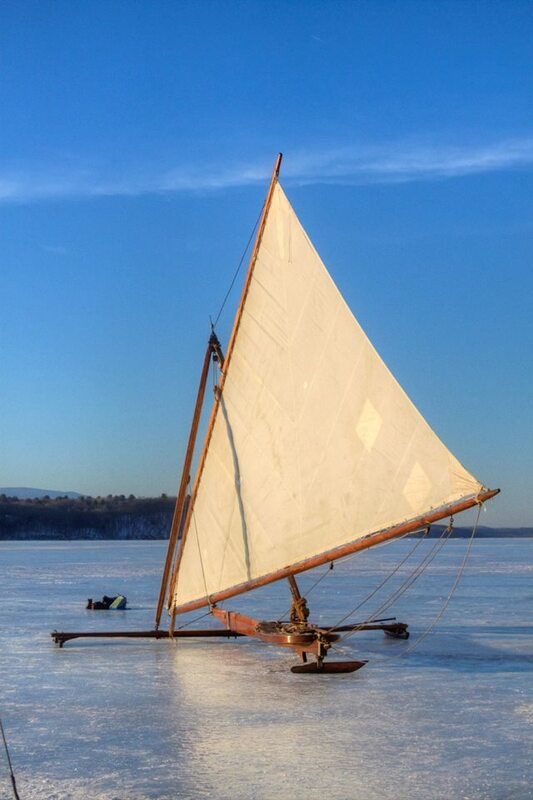 I’ve never seen ice boats – what gorgeous photos!! I have so much to be thankful for! Neat photos. My excitement comes from my older two girls being at a sleepover tonight! Then on Sunday all three of my girls go to a friend’s house so my husband and I get to go to SA’s Paella Challenge. We rarely ever get alone time so this excites the heck out of me! 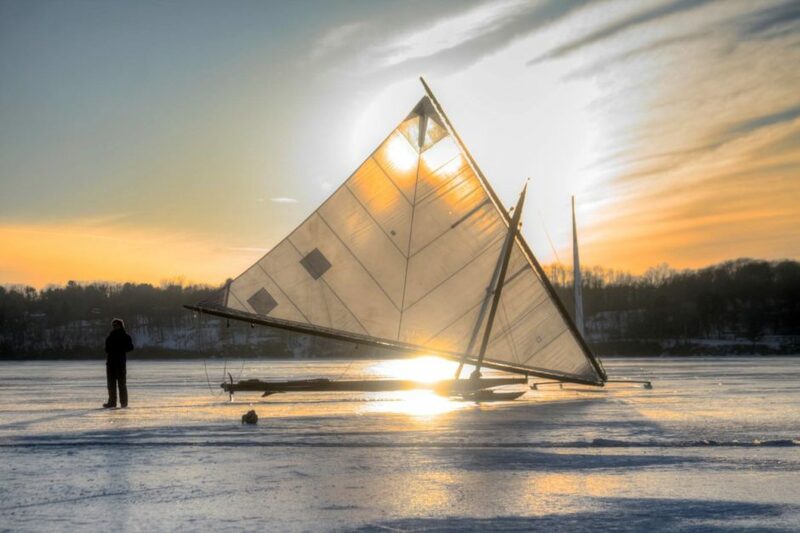 Love the ice boat pictures, they are amazing!!! Sounds like lots of great things in life for you right now. These pics are all gorgeous! I loved Saving Mr. Banks. I’ve never heard of ice boating before. I really love the pictures. It looks real peaceful. Those photos are gorgeous!! Today, I’m thankful that it’s the weekend. It’s been sort of a crazy week and I’m just ready to wind down a bit. I also love Books on CD. You’re not the only one. I also really want to see Mr Banks and have been watching alot of movies this winter. 🙂 Happy Friday. What gorgeous photos….I love posts like this. I also love Saving Mr. Banks! Oh that last photo! Be still my heart. Definitely going on to read the Mental Health Update post. I started writing about my anxiety about two years ago or so, and I was amazed at how much support I got, and always how manly people have found themselves somewhat in my shoes. I know, I love it too! Andy’s having a show coming up where he’ll feature a bunch of these- we’re so excited! Those photos are amazing. I’m grateful this week is over and the weekend is looking to be fairly promising. The weather is supposed to only be improving here in NC and I have spring break for a few days next week (I work for a college.) I can’t complain. Such beautiful photos! I am grateful that my parents are coming back to visit in a few weeks to help out and give us a break from the sleep deprivated life with a newborn! 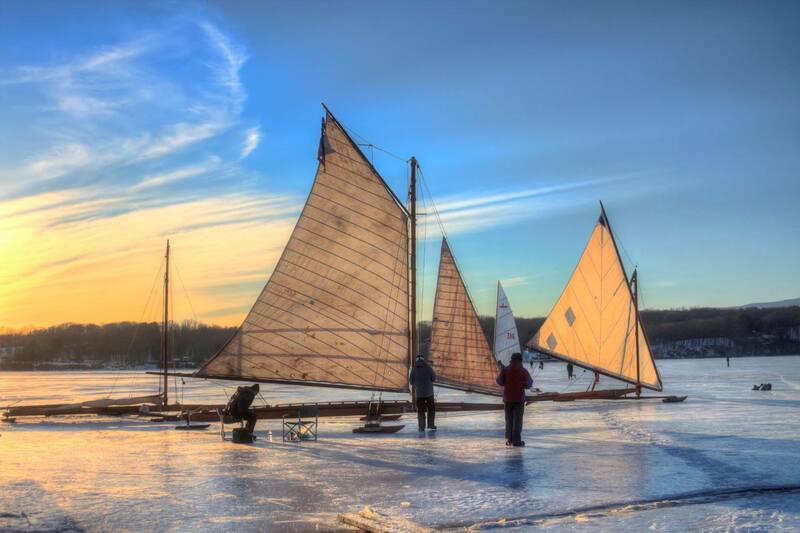 Those ice boat photos are awesome! I’m grateful that our old hometown bakery just reopened after being closed for 10 years and I’m going there tomorrow! Right now, I’m grateful for my Wi-fi! I have been able to get so much work done today because of it! Right now I’m grateful I have inspiration back for my book! I hope I can finish it this year! I’m grateful to just be here! I had surgery 2 weeks ago and it’s been tough. Now hubby had his done less than a week so we’re both recuperating together. I’m just thankful that we’re going to be better together. Lovely photos! Oh my gosh, those pictures are amazing!! I love every single one of them. I’ve never heard of the sport. I can def. see the appeal. “What’s good right now.” I love that! I need to stop and think about that more often. Thanks for that phrase. His photos are amazing. What a beautiful thing to witness. And thanks for sharing about the movie. I’ve wanted to see it but haven’t gotten around to it yet. Guess I’ll step that up. I love audio books, too! My vision fluctuates so reading isn’t always possible for me. Audio books have brought reading back into my life. 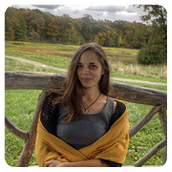 Thanks also for the link to the blog post about mental illness. I’ll be going there as soon as I’m done with this comment. I’ve struggled with depression since I was fourteen (I’m 44 now). We have several mental health issues in our family, so I’m always on the lookout for others who write openly about it. Something I’m grateful for right now is a diagnosis. I’ve been hurting a lot for months and finally got an answer. It’s not something I’m thrilled about because it will require surgery and possibly a hysterectomy, but it can be fixed and we know what it is and it isn’t dangerous. All of those are wonderful things! Thanks for reminding me to be grateful. I need to think of that phrase more often myself! I swear, I’m writing these type of posts as much for myself as my readers. Glad you got a diagnosis- I understand how frustrating it can be not knowing what’s going on with your body and why. How cool would it be to sail across the Hudson!! That looks like fun. This coming week is my sons birthday so I am grateful for that as I am excited to celebrate him. Thanks!! Those photos are gorgeous!!!! I have yet to see Saving Mr. Banks, I really want to. Those photos are amazing! Just looking at them gives me a peaceful feeling. What a great practice it is to stop and list things you’re thankful for!! This past week I had a really bad day with my fussy newborn and a jealous strong-willed toddler. I was so relieved when my husband was coming home to help out! When he got home he told me that the power was out all over town except for a small area where we lived. Even though it was a rough day I was suddenly overwhelmed with gratitude. I love these gratitude posts. Such a simple reminder of all that’s good or going well in our lives. Those photos are beautiful! I’m grateful for books and movies, too… though I haven’t been able to ever get into audio books. I think I just need to be able to see the words on the page to fully absorb it! My family is my greatest gratitude! Your images are stunning. Love that Women’s Travel Fest. Those pictures are gorgeous, they’d look so great framed on a wall. To be honest though, I’ve never heard of Ice Boating before now.